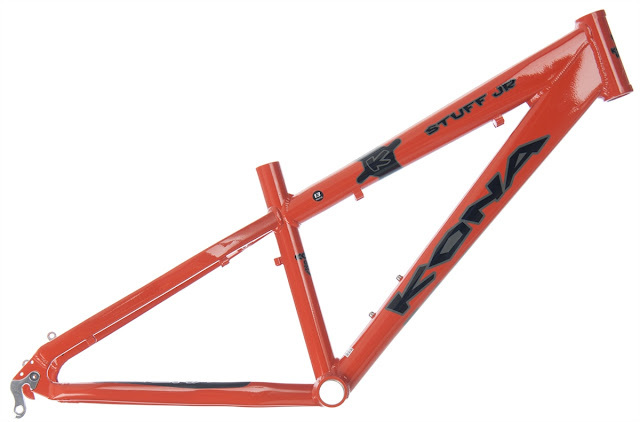 I've started a project with my son to build a bike, a mountain bike. I bought him a new frame and thought it'd be a good idea for him as a project over the summer holidays. He currently has a cheap Apollo mountain bike so I thought it's about time he realised how much better it is to ride a quality bike. Apart from the disc brakes, which will come from my bike, every part will be new. I will help him choose the parts and teach him what each component does. I will then supervise the build and help where necessary. I must remember that it's his bike and not mine. It'll be so easy to take over and do it all for him. Ooo exciting. what wheel size is that for? 24inch? Yes it's 24" wheel. He's a little small for his age and it can always be passed on to his younger brother in future. Cool! Kona, ace bike, always loved them! That's a nice bonding project. Looking forward to seeing the final build.